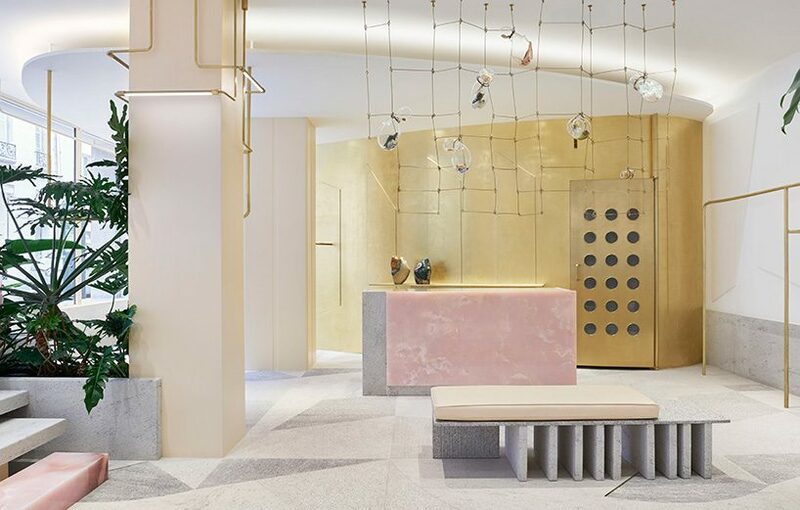 italian clothing brand forte_forte weaves a narrative of atmospheres, materials, and sensations in its new boutique in paris, located in one of the iconic corner buildings of the left bank. 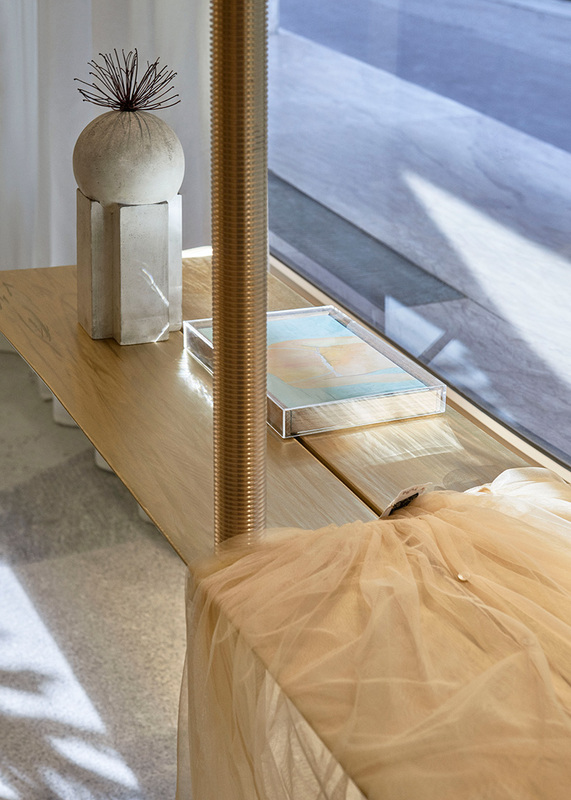 echoing the architectural geometries of jean prouvé and carlo scarpa, the 120 sqm space, recessed below street level, boasts a palette of refined, delicate materials combined with hand-made treatments and finishes that add to its welcoming, intimate character. 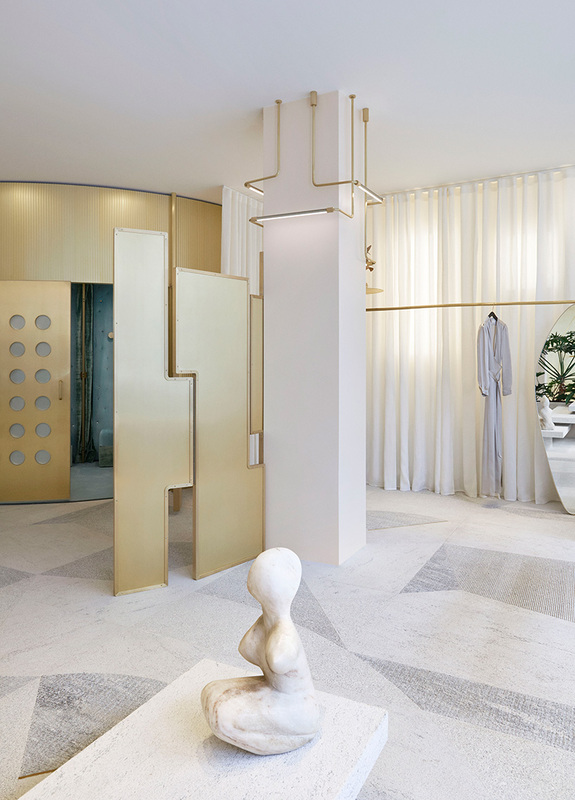 conceived by co-founder giada forte and robert vattilana, the brand‘s creative director, the boutique features an expressive synthesis of delicate, feminine, and strong elements. 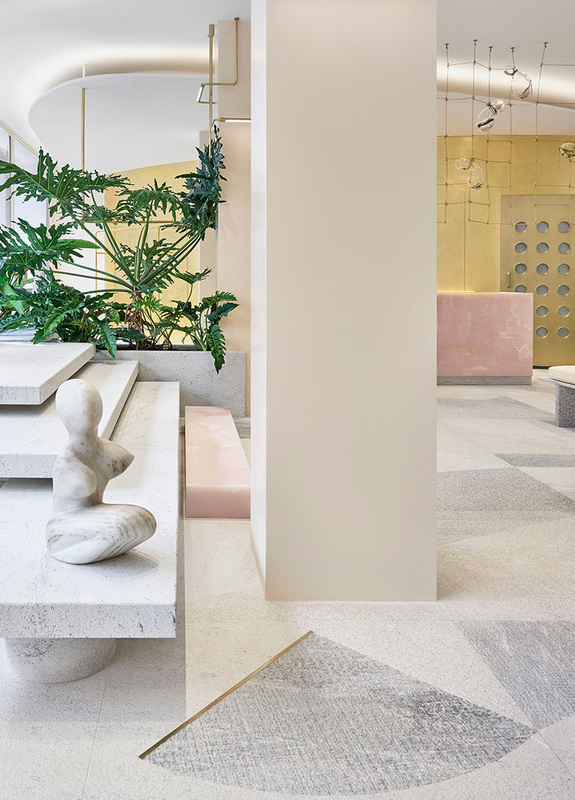 a sculptural granite staircase at the store’s entrance acts as a threshold, display, seat and support, concluding in a monolithic step made of pink onyx. 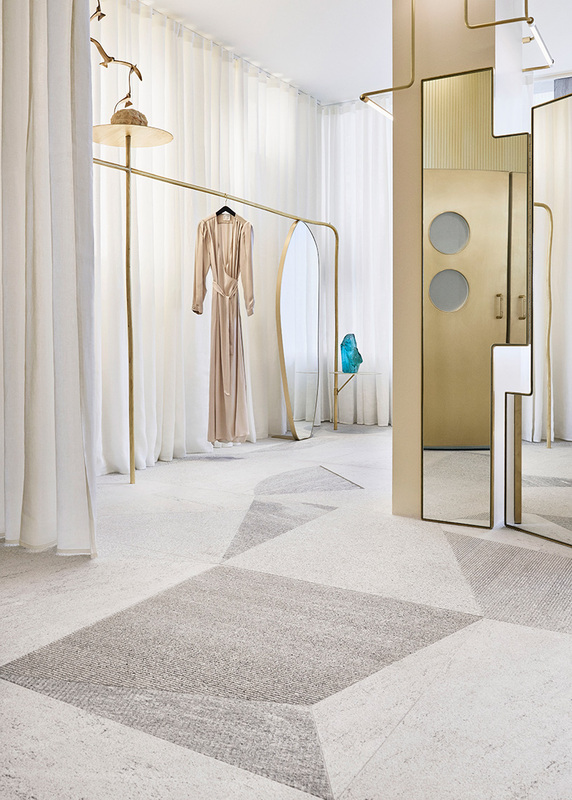 granite is also found on the floors, wall panels and furnishings, intersected by quartz and brass elements laid in geometric patterns. 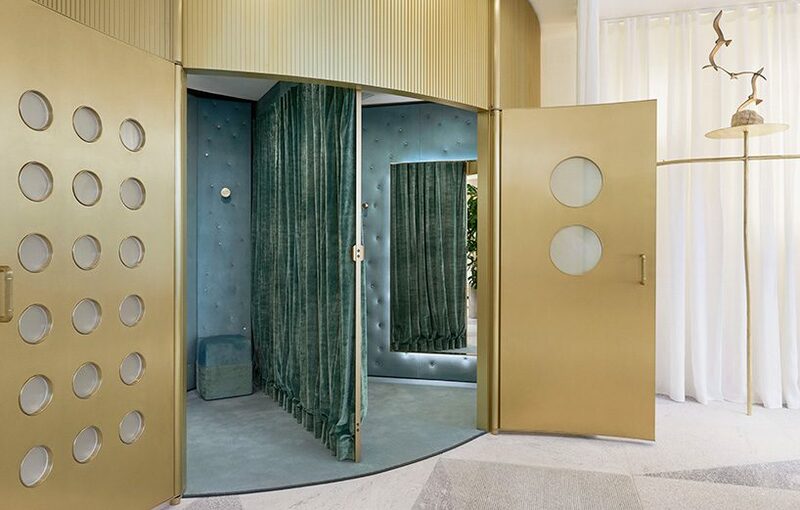 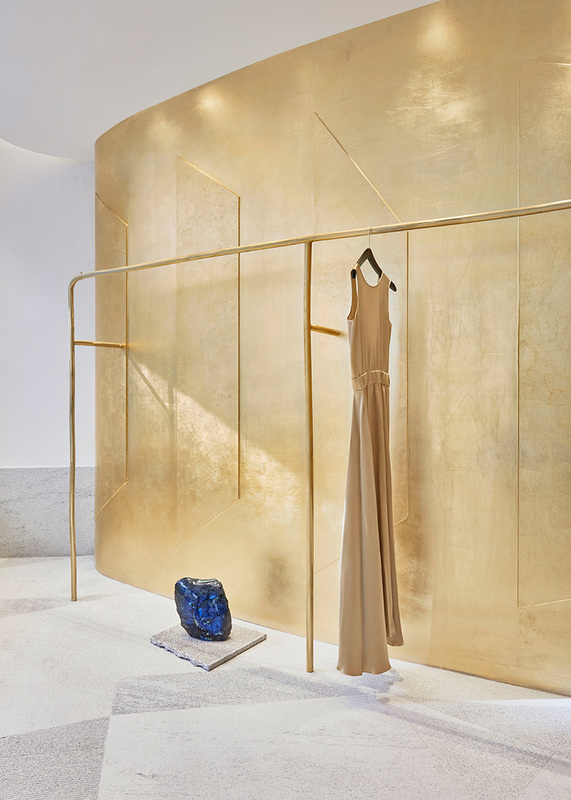 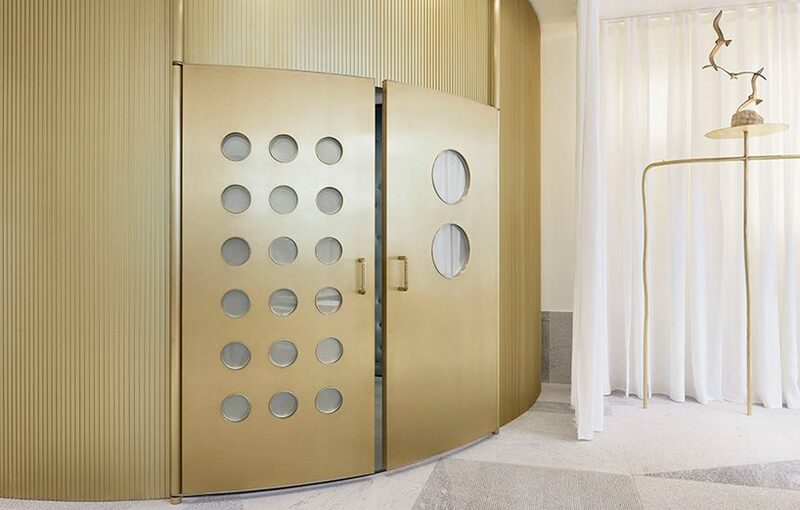 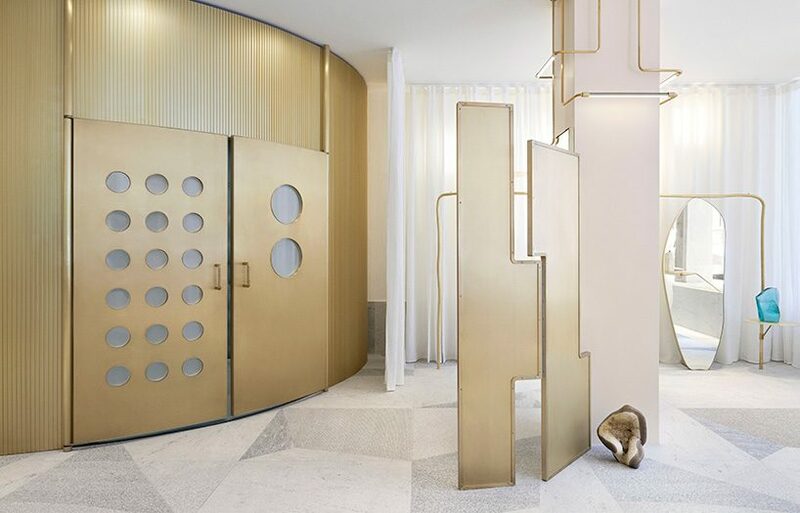 a gold-leaf curved wall encloses the warehouse area, while gold hues are also found on the store’s dressing rooms, which are finished with frosted-brass hinged doors. 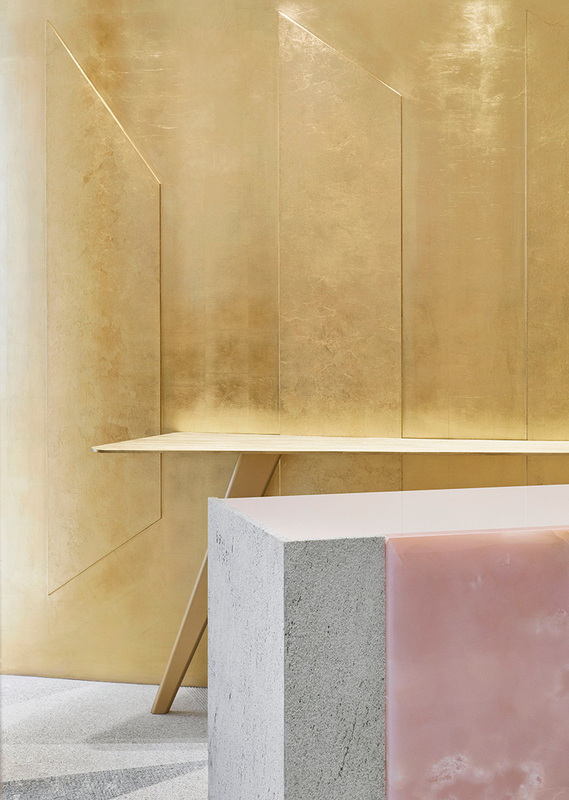 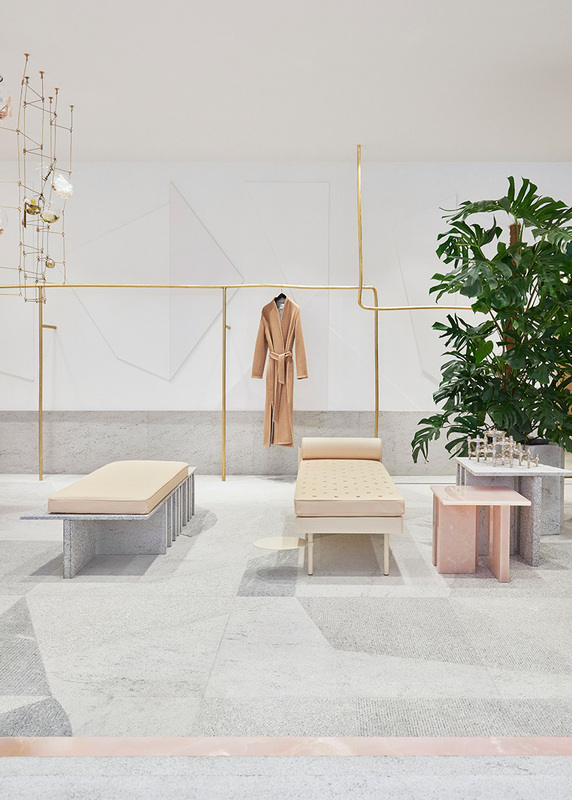 pink onyx elements in the forte_forte boutique embody a feminine and precious presence in the shapes of a small table, a part of the cash desk, and the entrance step. 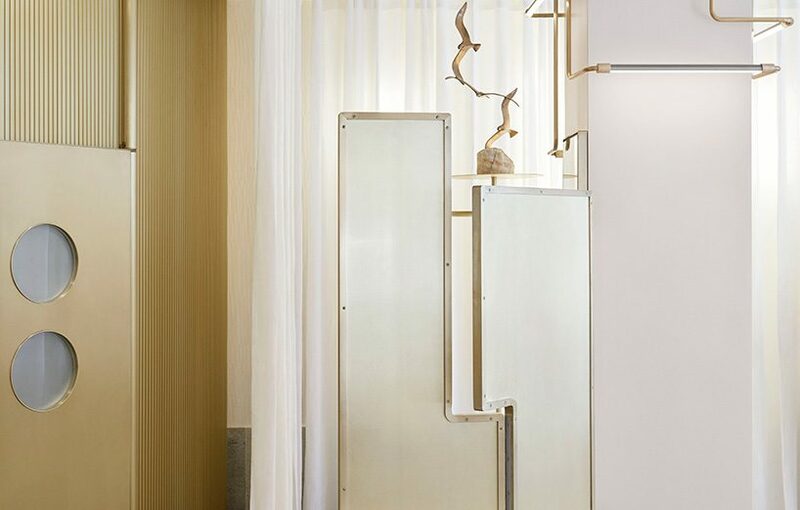 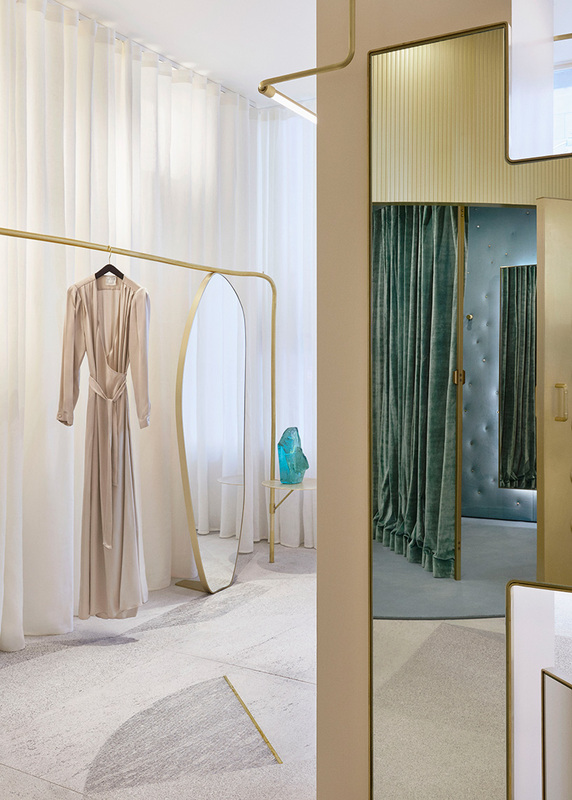 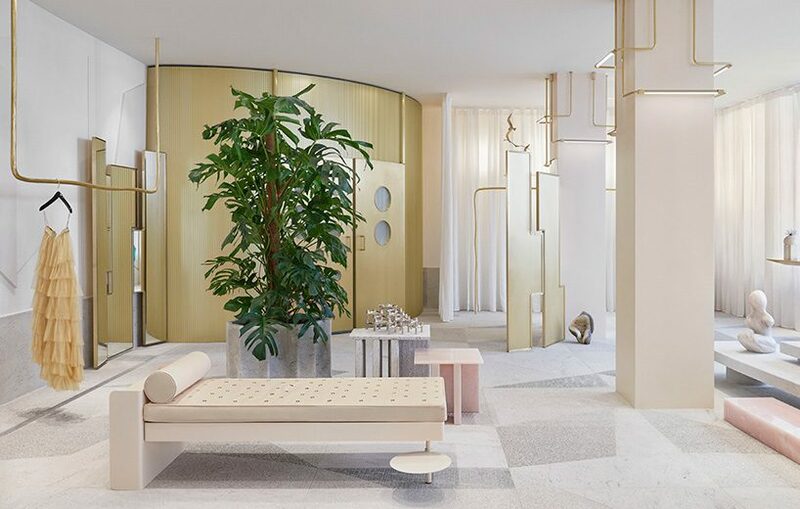 other refined details include mirror triptychs, full-height, white linen curtains that alternate with the voluptuous capitonné velvet of the dressing rooms, and linear brass light fixtures surrounding the boutique’s columns.